MADAGASCAR – the name itself inspires fascination, a mystical island cut off from the rest of the world since the early 1960s when the French gave the colony back to the Malagasy people. A socialist government took the reins of governing the country for many years and international tourism never really took off. In the early part of the new millennium a democratic government came to power and the country opened its doors to more international trade & tourism. Hence, Madagascar has been called a ‘New Tourist Frontier’. Tourists now flock to the Mystical island of Madagascar to explore its wildlife, birds, plants, beaches and many virgin coral reefs. There have been various estimates but approximately 50% of all wildlife and plant life in the country are endemic to Madagascar and found nowhere else in the world. Being the fourth largest island in the world measuring over 1500 km long and over 550 km wide it lends itself to many different tribes, cultures and dialects. Having been largely cut off from the world for so long Madagascar is still very natural (as the world was maybe 60 years ago) and has had the good fortune of not being overly westernised / modernised. It is not to say they do not have modern conveniences such as the Internet, they do, but traditions and cultures are still very prominent. This all makes for an intriguing and exciting holiday with a difference. The two most popular destinations are the tropical island of Nosy Be off the northewest coast and the idyllic island of Sainte Marie off the northeast coast of Madagascar. 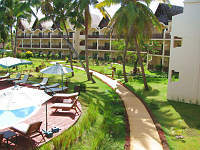 Both these island offer various activities and accommodation from economical beach chalets to 4* Hotel accommodation. 1. The Pangalanes Canal adventure is a must. Starting from Antananarivo and ending on Sainte Marie Island covering over 650km byroad, canal and finally a sea crossing to Sainte Marie Island with stopovers in the forests of Andasibe National Park (Perinet) and the Palmarium Reserve where you will find a huge variety of plants, trees, birds and lemurs including the largest of the lemurs, the Indri. 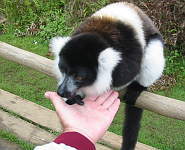 In the Palmarium Reserve you can interact with the absurdly tame lemurs, including the biggest Indri Lemur and the famous Sifaka or dancing lemur. 2. Another adventure tour takes you through the Tsingy rock formations. From Antananarivo you fly to Diego Suarez in the very northand work your way by road down through the forests and Tsingy rock formations to Nosy Be Island. Diego Suarez saw action in both WW1 & WW2. Battles were fought and today the guns still stand as sentinels overlooking the entrance to one of the world’s largest bays and natural harbours. This tour can be done with a 4×4 vehicle or as a guided quad bike tour. The latter, however, does require a minimum number of participants. 3. A third adventure to consider is a River Canoe Tour. Starting in Antananarivo and heading west by road down to the Tsiribihina River where your guide paddles you approx 160 km down the river camping overnight along the way. There are no rapids and the experience is quiet and tranquil with much to see along the riverbanks. The river safari ends at Antsiraraka, where you transfer by road to Kirindy forest and then on to the beaches of Morondava to enjoy some beach relaxation on the west coast of Madagascar. An excursion to the well know Baobab Alley is a must. Maybe it is time to say, “Stop the world, I’m getting off” for a few days, away from the humdrum of your busy life. Escape to Madagascar. Next story Is Knysna the best holiday destination in South Africa?